I have a thing for sushi. My favorite sushi restaurant is Ru Sans in Charlotte. Akina’s isn’t bad and Red Bowl is good. But, alas, I can’t click my heels three times and appear at Ru Sans every time I get a yen for sushi. So, I learned to make basic sushi all by myself. I am, by no means, a sushi-ya (sushi chef) and I’ve never tried to make raw-fish sushi at home. Maybe I should add that to my non-existent bucket list. Anyway, I cheated and bought this handy dandy little gadget to help me out. And it made things so, so, so easy. Important Note: I ordered it from Amazon. Click here to see it. Psst – now that you are back on my website, look over to the right. Scroll up. No, down. That’s it. I allow Amazon to advertise on my page so I get an itty, bitty, tiny little percentage of anything ordered through my site. I made a whopping $18.00 over Christmas. It doesn’t cost you anything extra, but if and when you order from Amazon, do it through my website. Please and thank you. 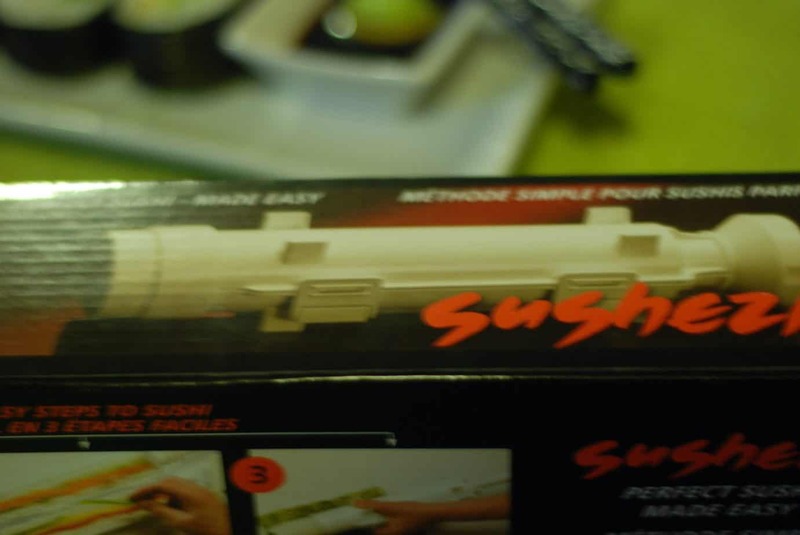 If you have the handy-dandy sushi maker gizmo, just follow the directions (pictures included). Did I mention how easy this is? 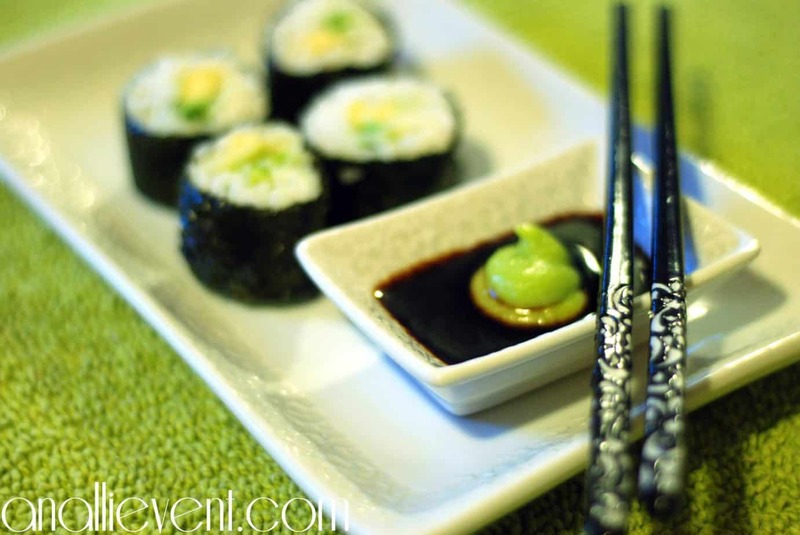 Just make sure the rough side of the Nori sheet is facing up when you roll. If you don’t have the gizmo, you can click here for easy directions. 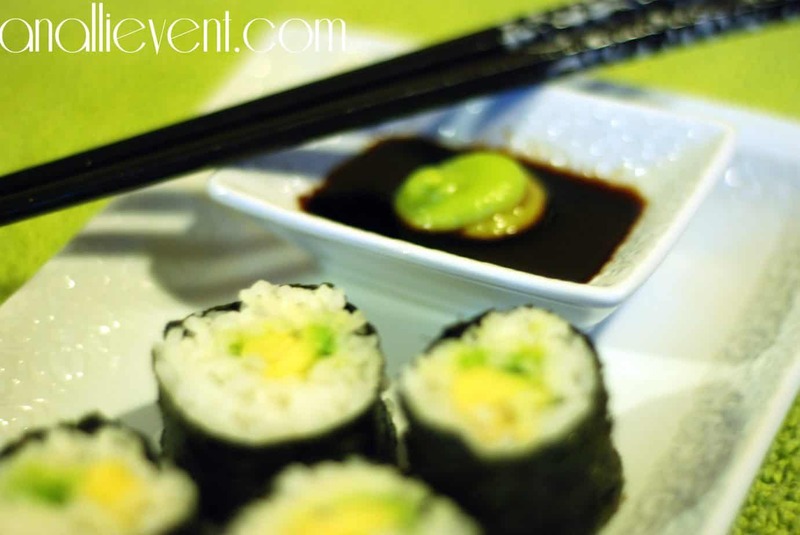 Serve with wasabi and soy sauce. Go easy on the wasabi, but personally, I like a little burn – OK, I like to almost deviate my septum (as daughter #3 refers to how much I love wasabi). I don’t eat soy sauce because of the sodium content (even in the low sodium kind) so I use my Kraft Asian Toasted Sesame Lite Dressing mixed with the wasabi. Yum-O! And, I received real chopsticks for Christmas! No more eating with the disposable ones!